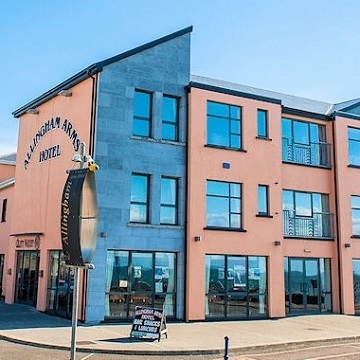 The Allingham Arms Hotel is a three-star hotel situated in the seaside town of Bundoran, County Donegal. It is located just steps from the beach, town centre and numerous other amenities, making it an ideal choice for accommodation in the North West. Bundoran is a lively seaside town with many things to do. It is a popular place for surfing and boasts three excellent surf schools that offer lessons and hire equipment. Other local activities include golfing, horse riding, angling and walking. Bundoran has a well established reputation for the being the entertainment capital of Ireland and with its development of its surfing and adventure facilities, Bundoran is on track to become a haven that will satisfy every need.